Who would expect that someone with very frail health since birth, who failed in all trades he tried because of it, would make great strides in the church? Brother Andre was the eighth of 12 children born to a French Canadian couple. His parents died when he was 12 and was given to adoption. He became a farmhand, shoemaker, shoemaker and blacksmith where he turned out a failure. He became a factory worker in the United States during the boom period of the Civil War. Brother Andre was a devotee of St. Joseph. When he reached 25 years old, he applied to join the Congregation of the Holy Cross. After a year as novitiate, he was not accepted because of ill health. With the help of Bishop Bourget, he was finally accepted as lay brother. 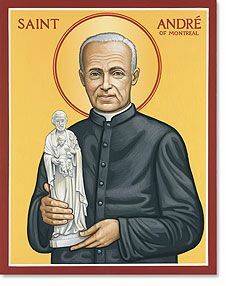 He was assigned to the simple job as doorkeeper of the Notre Dame College in Montreal, with additional duties as sacristan, laundry worker and messenger. He was faithful to his duties for 40 years. In his little room near the door, on the window sill facing Mount Royal was a statue of St. Joseph. He would often say that someday, St. Joseph will be honored at Mount Royal in a special way. Being of frail health, Andre was moved every time he hears someone is sick. He would immediately visit the person to cheer and pray with him. He would rub the person with oil taken from the lamp burning in the college chapel. Word of healing power started to spread. When an epidemic broke out at the nearby college, he volunteered to nurse the sick. Not one person died. He then got flooded with sick people seeking healing. Diocesan superiors were suspicious. Doctors called him quack. But he insisted that it was St. Joseph, not he, who cured them. In the end, he needed four Secretaries to handle the 80,000 letters he received each year. For many years, Holy Cross wanted to buy a land at Mount Royal so that a chapel can be built for St. Joseph. Brother Andre and others climbed the hill and planted medals of St. Joseph. Eventually, the owner yielded. Andre solicited and built a small chapel out of the $200 he was able to gather. There he received visitors, smiling to them for long hours, applying St. Joseph oil. By 1931, the chapel grew. Gleaming walls were built but when money ran out, Andre ordered that a statue of St. Joseph be put in the middle saying, “If he wants a roof over his head, he will get it”. The magnificent oratory on Mount Royal took 50 years to build. The sickly boy who could not hold a job was able to build such a large monument! St. Andre is an example of how one’s weakness can turn out to be one’s source of strength. We are often conscious about our weaknesses and think that there is nothing we can do to contribute for the building of the kingdom of God and for the betterment of society. St. Andre’s story also shows how marvelously God works and uses even the least for a great purpose. Every person has a gift that he can use to glorify God. We just have to listen to God’s call in our heart and he will do the rest. We thank you God for St. Andre through whose life we learn the value of simplicity of heart. Help us to follow his example in giving witness even in the ordinariness of daily living. Help us to transform our weakness into strength and to glorify you in our life. Amen.